Lawyer Eren Keskin: 7½ years, propaganda of terrorism. Lawyer Ayse Batumlu: 5 months, propaganda of terrorism. Lawyer Akın Atalay: 7½ years, propaganda of terrorism. Lawyer Mustafa Kemal Güngör: 4 years, propaganda of terrorism. Lawyer Bülent Utku: 2 years, propaganda of terrorism. Lawyer Suphi Bat: 8 years & 9 months, membership to an armed terrorist organization. Lawyer Burak Keskin: 7½ years, membership to an armed terrorist organization. Lawyer Burak Karaduman: 7 years, membership to an armed terrorist organization. Lawyer Özge Elif Hendekçi: 7 years & 11 months, membership to an armed terrorist organization. Lawyer Yılmaz Çiçek: 7¼ years, membership to an armed terrorist organization. Lawyer Mustafa Çağlar Akgun: 6¼ years, membership to an armed terrorist organization. Lawyer Ali Rıza Mete: 6¼ years, membership to an armed terrorist organization. Lawyer Selim Ozkan: 6¼ years, membership to an armed terrorist organization. Lawyer Coşkun Taşkın: 6¼ years, membership to an armed terrorist organization. Lawyer Salih Boyalı: 6¼ years, membership to an armed terrorist organization. Lawyer Turan Öztürk: 6¼ years, membership to an armed terrorist organization. Lawyer Yakup Başer: 6¼ years, membership to an armed terrorist organization. Lawyer Kamil Ata: 6¼ years, membership to an armed terrorist organization. Lawyer Fidel Okan: 1½ years, insulting a public officer. Lawyer Ramazan Demir: 11 months, propaganda of terrorism. Lawyer Dogan Akkurt: 5 years & 10 months, membership to an armed terrorist organization. There has been a relentless campaign of arrests which has targeted fellow lawyers across the country. In 77 of Turkey’s 81 provinces, lawyers have been detained and arrested on trumped-up charges as part of criminal investigations orchestrated by the political authorities and conducted by provincial public prosecutors. 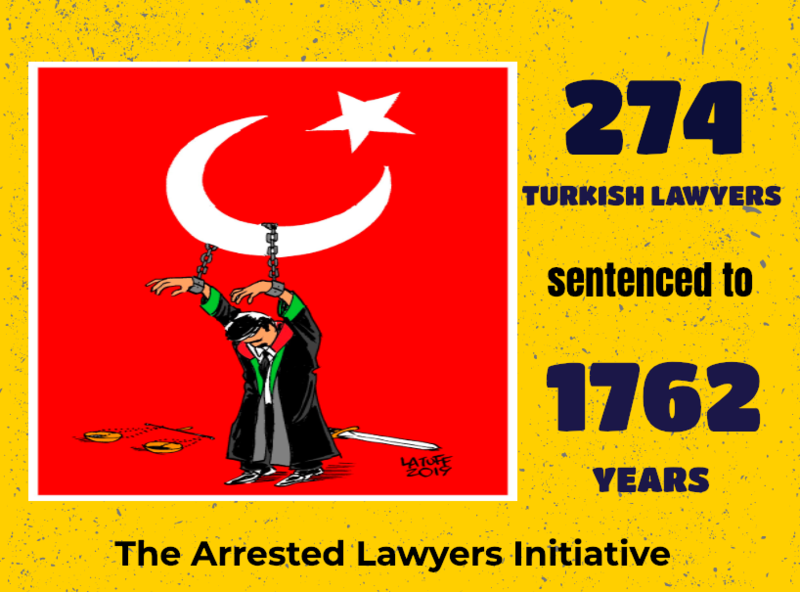 As of today, 582 lawyers have been arrested and 1544 lawyers are under prosecution, 162 lawyers were sentenced to long imprisonment. Some of the arrested lawyers were subjected torture and ill-treatment.